A GRIP ON SPORTS • We assume you are a sports fan if you are reading this. Which makes us believe you are aware of the fabled Sports Illustrated jinx. And believe in such things. Read on. • Years ago, when magazines were actually important in the national landscape, athletes vied to get off Sports Illustrated’s cover. Why? Because of the jinx. Say, for example, the magazine put Ray Finkle on the cover before the Super Bowl. Sure as heck, Finkle would miss the game-winning kick. Happened all the time. As the years rolled by, other publications would tout their jinxes. But none rivaled SI. Or ever will, considering magazines are starting to become part of the dustbin of history, like horse-drawn carriages and flip phones. But we are a bit worried here at the S-R South Hill annex. After all, Gonzaga hosts Saint Mary’s tonight in a renewal of the West Coast Conference’s most intense rivalry and the Zags’ Brandon Clarke is all over our website. Is there an S-R jinx? And will it limit Clarke’s productiveness tonight? C’mon, you really don’t believe in that malarkey, do you? Besides, for there to be a jinx, as I understand it, the publication has to have a circulation surpassing 131,313. And the S-R doesn’t reach that threshold anymore. • The Saint Mary’s visit, always one that excites the fans in the Kennel, is just one of 33 college basketball games you can watch on television today. The best of those is at 3 p.m., when third-ranked Virginia hosts No. 2 Duke. It’s a rematch of an ACC game earlier this season. 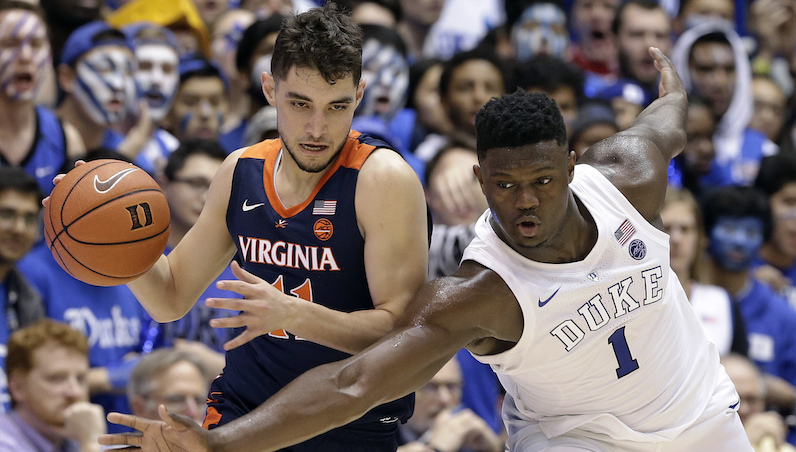 In that first game, won by Duke 72-70, the Blue Devils were without their starting point guard. In this one, the Cavaliers may be without starting point guard Ty Jerome, nursing a bad back. Neither team worries about injuries in early February, though. This year, both want to be healthy come March. If you don’t want to wait until the afternoon to watch a matchup of ranked teams, you don’t have to. At 9 a.m., Wisconsin, ranked 19th, will be at seventh-ranked Michigan in a Big Ten battle. And, at 11:30 in the morning, 10th-ranked Marquette hosts No. 14 Villanova with Big East supremacy on the line. It’s another typically busy college basketball Saturday. 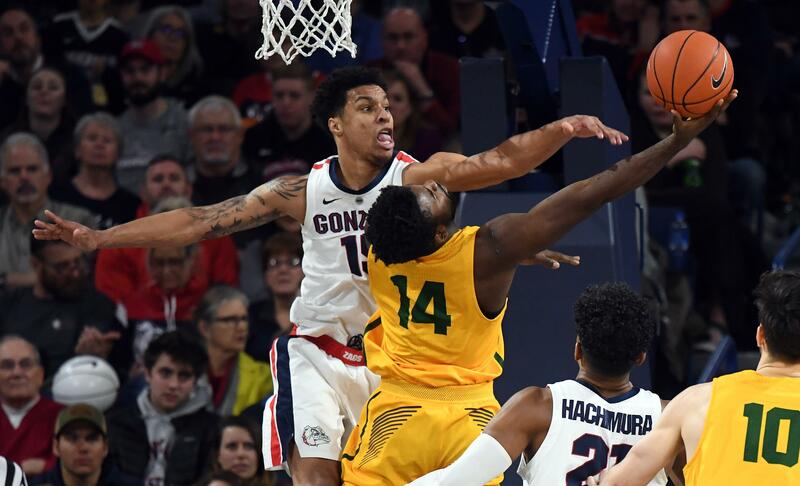 Gonzaga: As we said, there is a lot of Brandon Clarke content today, beginning with John Blanchette’s column on Gonzaga’s single-season shot block leader. … Jim Meehan also lists Clarke among the school’s all-time best leapers. … Jim has a preview of tonight’s game with Saint Mary’s as well as a look at the key matchup. … Justin Reed, who chips in on the GU coverage, talked with Larry Weir yesterday about the Zags. That’s our latest Press Box pod. … The women are in Portland for their lone game this week. Jim Allen has a preview. … Around the WCC, don’t look now, but BYU has worked its way up the men’s conference standings and is in second place. WSU: The Cougars posted their most impressive win of the season Thursday night in Tempe. Theo Lawson wasn’t in the desert, but he did look back at the victory. … Going into the week, Arizona thought it had one tough game and a certain win. Now the Wildcats are worried about getting swept at home. … Elsewhere in the Pac-12, Washington’s defense is its strength. And that defense has a strength. … Winning at home is important to Oregon. … Winning at USC is important to Colorado. … Utah has a chance to sweep its four California games, but it will have to win at UCLA. … Arizona State needs to bounce back after the loss to WSU. … There is football news, as ASU is in the middle of spring practice. … And there is Pac-12 media news as well. Well, not so much news as a look at the future. Whitworth: It wasn’t easy, but the Pirates rallied late and stunned Linfield, 74-73 at the Fieldhouse. The win all but assured the Whits will finish second in the Northwest Conference and probably host Linfield again in the postseason tournament semifinals. Dan Thompson was there and has this game story. Chiefs: After a long losing streak, Spokane has turned the corner and has won four of its last five games. Kevin Dudley was at the latest win, an 8-3 decision over Victoria at the Arena last night. Preps: The weather threw a wrench into Washington’s state playoff machine yesterday, forcing some postponements and other changes, all of which Dave Nichols covered in this story. … There was some basketball, including the 2A Districts, which Dave also covered. … We have roundups of what wrestling and basketball action there was. Mariners: Spring training is just around the corner. Thank goodness. Anyhow, it’s time to begin looking at the new-look Mariners and all their strengths and weaknesses. Published: Feb. 9, 2019, 8:09 a.m.